What can I say about Notre Dame that dozens of other reviewers haven’t already said? It’s the most famous cathedral in the world and, after having visited, definitely one of the most beautiful. One of the most common things I had heard about Notre Dame were the intolerable crowds, especially during summertime. I went in September and visited the cathedral right at 8:30 in the morning on a Thursday and it was practically empty. If you have the chance to visit in the off-season, do so, and make sure to visit first thing in the morning before all the tour buses get there. The interior of the cathedral is incredibly beautiful, and you’ll need an hour (at least) to really savor all of the little details which set this cathedral apart from so many others: the intricate carvings, the majestically-decorated chapels, the exquisite rose windows, and the countless Gothic arches dramatically lit by candles and chandeliers. If you can enjoy it without crowds and incessant camera flashes, the atmosphere is truly magical. And, if you’re a photographer, it’s one of the best subjects on Earth. The cathedral is a Gothic masterpiece. Make sure to pay special attention to the main facade, the western porticoes, the west rose window which circles the Virgin in a multitude of colors, and the Gallery of Kings representing the 28 kings of Israel. Other highlights are the Portal of the Virgin, surrounded as she is by saints and kings, and the flying buttresses which guard the cathedral’s objects of worship. 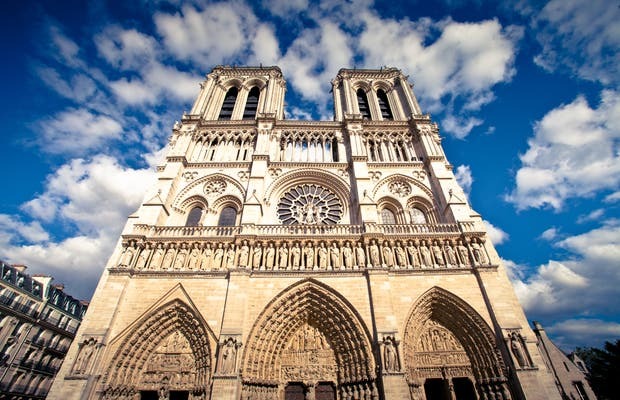 Once inside, make sure to check out the paintings by Le Brun, the rose windows, the statue of Notre-Dame and the statues of The Piety and Louis XIV behind the altar. Climbing the towers is one of the most popular activities at Notre-Dame. The square where this cathedral is located is the "kilometer zero" of all roads in France and Parisians consider it more of a fellow citizen than a monument. It was originally a small Christian basilica which, after several renovations and expansions, has becomethe architectural wonder we see today. The Revolutionaries raged against her, tearing down the statues and replacing the stained glass with plain crystal. In fact, when Napoleon took over Paris, the Cathedral had fallen to such a state of disuse that it was being actually being used as a barn! After visiting the interior, which lacks the richness of detail of later churches, and after a long wait made easier by some Nutella crêpes and an impromptu street-comedy act, we climbed the towers. Halfway up the 387 steps there is a rest point which, conveniently, is a souvenir shop. I visited Paris recently and had to visit Notre Dame! I loved the way they lit it so that all of the architecture could really be shown off. There was an orchestral concert happening at the time I arrived and the acoustics were beautiful! Notre Dame is spiritually impressive in it's own right, but to climb to the precipice and get this view of Tour Eiffel, the Ile St. Louis, the Seine and the city panorama is truly inspiring. Paris is not only for lovers, but also historians, explorers, artists and the deliberate traveler. Paris' patron saint, St Peter carrying his head, is on Notre Dame. As well as the stories in the Bible. The line was big and we decided not to go in. We stayed outside enjoying the architecture and the people from all around the world. Beautiful.